Finding evidence for the use of plants during the Lower Palaeolithic is very challenging and the role of plants in these early periods has consequently been largely overlooked. However, humans cannot survive without eating plants (Hardy et al. 2015b). Our evidence for the consumption of at least two different starchy plants, in addition to the direct evidence for consumption of meat and use of plant-based raw materials, suggests that this very early European hominin population had a detailed understanding of its surroundings and a broad diet. The diet of our ancient uncle was likened to that of modern-day chimpanzees. These bones were abandoned many millennia before man started cooking foods with fire. The eating of raw starches continued as man left Africa and conquered the world. Various sources of starch are found everywhere man settled. Cattails, acorns, palm starch, yams, potatoes, and many others are found all over the world. These starchy foods not only provided nutrition, but they more importantly fed our gut flora. Flash forward to modern times, and ask yourself, “When did I last eat a raw starch granule?” It’s doubtful that anyone reading this has ever made a meal of uncooked seeds or raw tubers. (Most) Modern humans posses gut bacteria that’s capable of turning raw starches into the short-chain fatty acids (SCFA) that keep our intestines and immune system functioning properly. However, the modern fiber-poor diet provides only a fraction of what we need. Some modern-day foods we can eat to feed our gut flora are raw potatoes and very green bananas…neither extremely delicious, but they can be snacked on or put into smoothies. A good habit is to eat a slice or two of raw potato any time you’re cutting up spuds for a meal. Another good trick is to take a raw starch supplement…potato starch, Hi-Maize, or banana flour are all easy to find as well as commercially-made blends containing resistant starch. These can be taken mixed with water, milk, or any cold liquid. A spoonful or two per day is all we need to keep our guts running like they were meant to. The examination of million-year-old teeth show that the earliest humans ate foods that contained raw starches. It’s my belief that we still need to eat raw starches, in the form of resistant starch, in order to eat what I consider a truly human diet. 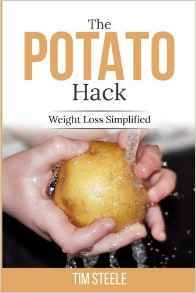 The Potato Hack’s all-potato diet uses cooked potatoes, but I like to recommend that people undercook their potatoes, and even eat a slice or two of raw potato. This allows ingestion of a special kind of starch, resistant starch, found in raw starchy foods. I think that goes for everyone. And some people never seem to adapt to a particular fiber supplement which is why I’m not stuck on any one type. Inulin, potato starch, banana flour, and Hi-Maize seem to fit needs of most, and most people can find one, or a combo, they can tolerate. How’s your experience been with the Gut Health prebiotic product? 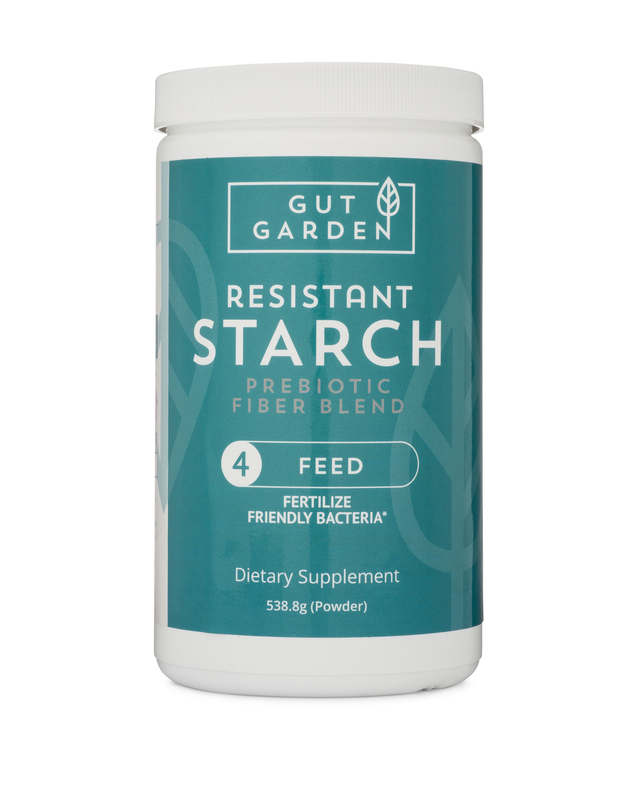 If you are asking about Gut Garden Resistant Starch, I think it’s great! I’ve gone through 2 jars so far and I think it is a vast improvement over taking just potato starch alone. And not even in the same class as the row after row of “fiber” supplements you see at every supermarket and drug store. I’ve heard good things from others as well. Thanks Tim, this is wonderful. Can one achieve the same type/benefits of RS from cooking and then cooling starches as opposed to eating them raw? Same results, yes, but the problem is quantity. For instance, a raw potato or yam may have 50g of RS2 (uncooked starch) but when you cook and cool it, only 5g. If you’re eating predominately cooked starchy tubers, you are good to go (as in The Potato Hack), but normal eating patterns don’t provide much RS. If eaten uncooked, are bamboo shoots considered raw starchy tubers? Might be a more palatable(albeit a bit more expensive and harder to find) option over raw potatoes? Hard to say. My gut feeling is that they are low in RS. Plants produce starches as a storage/survival product, shoots generally do not contain starch. But, shoots are incredibly healthy in other ways, so bamboo shoots are certainly a good food choice and probably have lots of good fiber/prebiotic material in them. Today in one of the health food stores I regularly visit in Amsterdam, I FINELY found some Banana Flour. It doesn’t say on the lable that it is plaintain flour – it just says bananenmeel – but I’m keeping my fingers crossed. It definitely has the yellowish colour and the same smell as my Australian Banana Resistant Starch. If you want, send me a small sample and I’ll test it with my other starches. I was looking for another banana sample, anyway. You have my email, right? Or get me through the Contact Me button for my mailing address. I was looking at the ratio of fibers in Gut Garden and I wondered if they are similar to what would be found in whole foods? GG’s ration of potato starch to inulin (12g/750mg) is 1:0.06 (if I did my arithmetic right). Is that the ratio you would find in a healthy diet? I think Lily did a great job mixing it, and people like it, so something must be right about it!